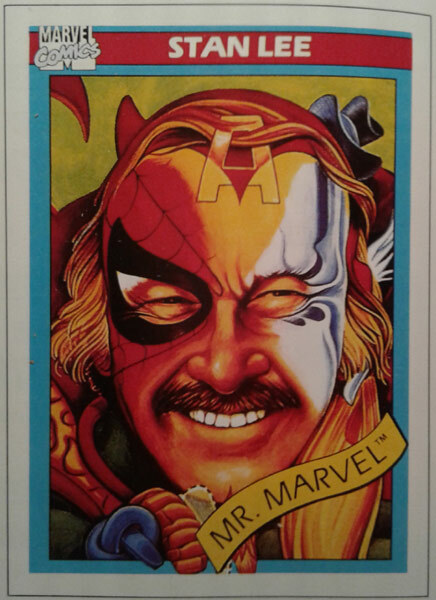 1990 trading card with original 1977 painting by Arnold Sawyer. Our universe will never again see a personality like Stan Lee. For the most part, that’s not a good thing. But one must understand and accept that Stan’s career was very much of its time. What he became in his final years was a calculated maneuver, the bookend of a carefully managed and marketed existence. I say that not out of judgment, but out of respect, however begrudging that respect might occasionally be. More than perhaps anyone else, Stan Lee was comic books. 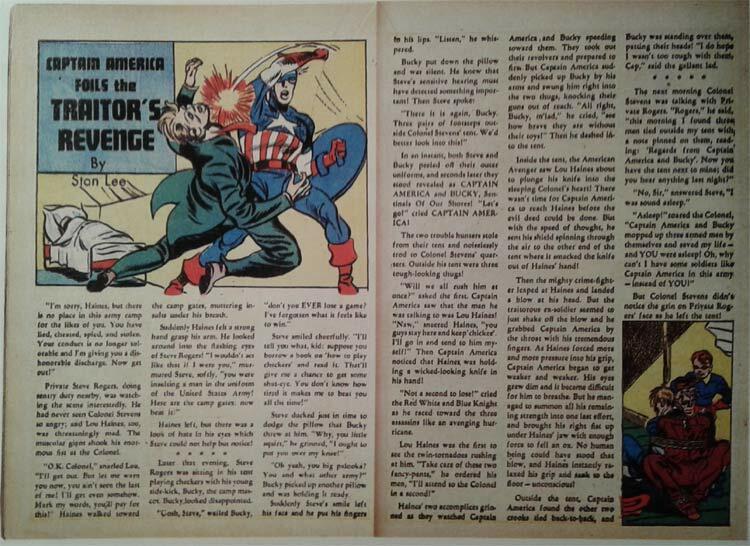 Stan Lee’s first published work in comics was prose; a two-page text tale included in Captain America #3 (May 1941) for the purpose of qualifying the book for less costly mailing rates (as a magazine). Budgetary reasons aside, the effort gave young Stan a proper debut as an idea man, with the ability to distill his fervent imagination into words, however purple those words might have been. Therein lies the difference. Stan Lee’s understanding of the comic book medium’s power was innate from the beginning. He wasn’t just some kid reading Marvel and imitating their art style to secure a lucrative future at the company. He had a nativity to comics that informed everything he did, for the remainder of the 20th century, and beyond. Until very recently, as a matter of fact. He was born Stanley Martin Lieber, in 1922. Of course he was born in New York City. He embodied the Big Apple, much like his talented contemporaries, Joe Simon and Jack Kirby. Because of Stan Lee, we know those names; they created Captain America. They didn’t get the short shrift, like at competitor DC, where the creators of titans Superman and Batman were obfuscated or improperly credited for decades. Stan was the teenage cousin of publisher Martin Goodman’s wife. He was first hired to assist Simon & Kirby on their hit Captain America, at the age of 17. Over the years, critics have charged Stan Lee with sticking his name on the work of other creators. What this accusation ignores is the fact that in the early going, comic books were equated with fish wrap. Stan added his name to works produced by men embarrassed to be involved in the enterprise. He was one of the few individuals who saw any future in comics, at all. Almost everyone else was trying to work their way up to science-fiction magazines- the kind of books the world forgot about, a half-century ago. In many ways, Stan Lee did write The Great American Novel. Rather, he lived it. I never had the pleasure of meeting Stan Lee. My exposure to the world of Marvel in my formative years was sparse, largely limited to Larry Hama and Mike Carlin’s CRAZY, Bob Budiansky’s The Transformers, and a few early issues of John Byrne’s Alpha Flight. Still, Stan’s DNA infused those projects; CRAZY was laden with guest appearances from Marvel’s superhero stable, and Spider-Man popped into the pages of Transformers, inauspiciously. The ol’ web-crawler introduced himself to an alien robot with the following line: “Like that funny lady on TV sez- ‘Can we talk? '” All due respect to the late Joan Rivers, but the idea that Spider-Man found her catchphrase pithy enough to quote in front of a robot from outer space soured me on his franchise more or less for good. Still, that unabashed, corny quaintness is the lifeblood of Marvel in its golden era. That’s the accessibility that Stan brought to the table. Whatever his faults might have been, they were overshadowed by an adoration of the format; not just love for what he and others created, but an inextinguishable faith in the medium’s potential. A dogged and relentless belief in the power of the imagination. That was Stan all over. During Tom DeFalco’s run as Marvel’s editor-in-chief, pre-bankruptcy, my writing partner worked in the old NYC building. I was barely out of high school and a total novice to the industry, but my friend showed me around Marvel’s digs, and as I hustled timidly through office after bustling office, I first felt the call. The little voice in your head saying you can do this. You can be part of this world. It’s valid. It’s real. You can touch it. My friend concluded the tour with an older office near the top of the building. He opened a window, revealing a seemingly endless cityscape of rooftops, iron walkways, and towering, moldering tenements. The gothic grotesques of Batman’s world were not present; this was beautiful, working-class, thriving New York City, all basic squares of mortar and glass. A metropolis alive with people. My friend informed me that this particular office was where the old Spider-Man artists used to gaze out the windows, for inspiration. “Can’t you just see Spider-Man web-swinging around out there?” he said. Of course I could. I couldn’t see anything but. That was just one of Stan Lee’s gifts to me, and my universe. Our universe. A true marvel. A man without whom, excelsior would mean nothing more than cheap packing material. 1 Les Daniels, Marvel: Five fabulous decades of the world’s greatest comics (Abrams, 1991) 41. 2 Les Daniels, Marvel: Five fabulous decades of the world’s greatest comics (Abrams, 1991) 41. 3 Stan Lee (introduction), Les Daniels, Marvel: Five fabulous decades of the world’s greatest comics (Abrams, 1991) 9.